Our spare bedroom was in need of some love. The brown and yellow patterned carpet had seen better days, the peach vertical office blinds were a) peach and b) not in an office and there was scary 1970s doll wallpaper in one corner where we had taken out the built-in wardrobe to make more space. It needed to be de-uglyed. We currently use it as a spare room but at some point in the future we might want to put a little person in there. Given that decorating makes me quite angry (a case of big ideas coupled with inadequate decorating skills) I didn’t want to decorate it twice, so wanted something that would work as a spare bedroom or as a nursery. 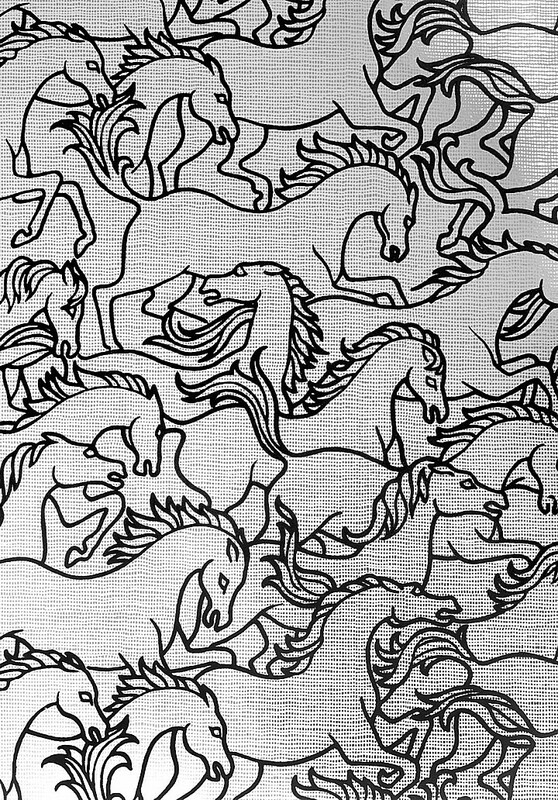 I have been hankering after the Florence Broadhurst wallpaper design ‘Horses Stampede’ from Places & Spaces for about eight years now. It comes in quite a few different colour ways and coordinating fabric (John Lewis sells cushions) but when I saw the £220 price tag I realised I’ll probably still be hankering after it in another eight years. Instead we settled on stampeding cows. This wallpaper from Brewers Marimekko 2 collection is still not cheap but we only needed one roll as it’s a wider width than normal. It’s good quality and thick enough that the edges don’t tear when wet with paste. My dad is a Wallpapering Master but even with his help we took some time lining up the design as it’s so busy, but it was worth it as you can’t see any of the joins. 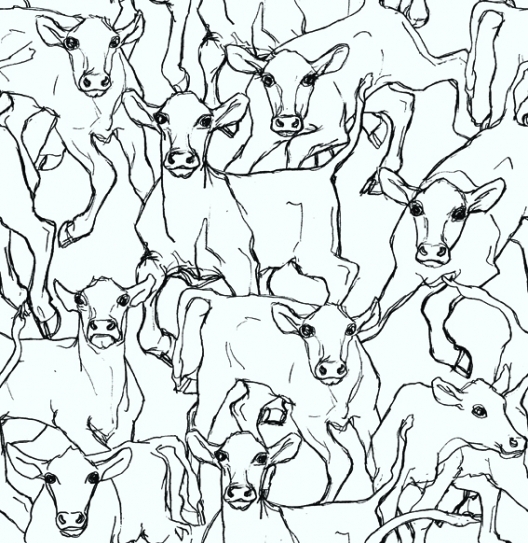 Each cow is slightly different and the hand-drawn feeling is really nice. It also comes with a bright background in either pink or green if you’re feeling bold. Once the cows were on the wall I felt the urge to paint some of the cow’s noses pale pink to add a bit of colour, but instead of ruining the new wallpaper bought a bright yellow throw in the sale and added some bright cushions. To save some money we decided I’d try my hand at fitting the carpet. A carpet offcut cost us £50 from our local carpet shop and after some You Tube tutorials I got stuck in. It was much easier than I expected. Considering this was a first attempt and I did it on my own, although not perfect, I am quite proud! 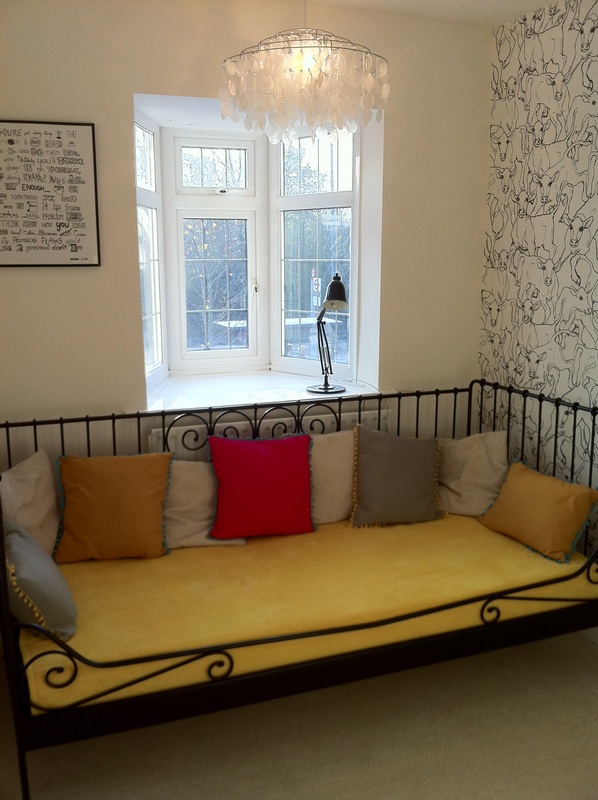 It probaly saved us around £100, which paid for the wallpaper, paste and tools.